The flower heads may look rather like umbellifers, but Common Valerian is more closely related to the Teasel than to Wild Carrot, Hogweed and the other umbellifers (family Apiaceae). Valeriana officinalis can grow up to 2m tall, producing deep pink buts that open into fairly loose clusters of pink five-petalled flowers, the petals joined at the base to form a trumpet-like corolla. 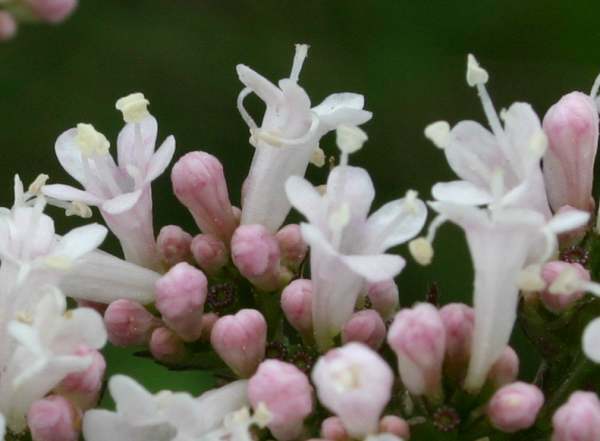 Common Valerian flowers are 4 to 5mm long. An upright perennial plant, Common Valerian spreads via stolons (underground runners) as well as by means of seeds. The branching stems carry opposite leaves, the lower leaves are stalked and upper leaves stalkless, and all are are pinnate with 6 to 11 lanceolate, bluntly-toothed leaflets. This plant is found throughout Britain and Ireland as well as most of mainland Europe and parts of Asia. Common Valerian has been introduced into North America and many other temperate parts of the world. 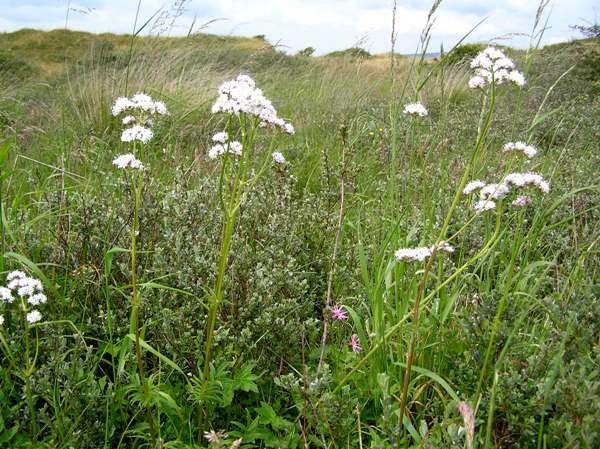 Common Valerian can be found in both dry grassland and damp grassland habitats, but it does not tolerate permanently waterlogged conditions (where its shorter relative Marsh Valerian thrives). 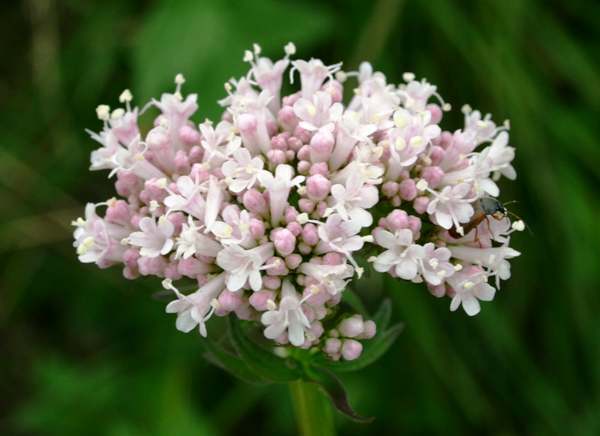 In Britain and Ireland Common Valerian blooms from June until the end of August - much later than Valeriana dioica. Sleeping potions known as Valerian were derived from this plant; they were used not only as a treatment for insomnia but also reputedly by thieves who spiked the drinks of intended victims. Valerian is still used as the source of sedatives for relaxing the central nervous system. The generic botanical name Valeriana comes from the Latin verb valere, meaning 'to be healthy'. In similar vein the specific epithet officinalis, literally meaning official, indicates that this plant was recognised as having valuable pharmaceutical /medicinal properties. The pictures of Common Valerian shown on this page were taken at Newborough Warren national Nature Reserve in North Wales during June.